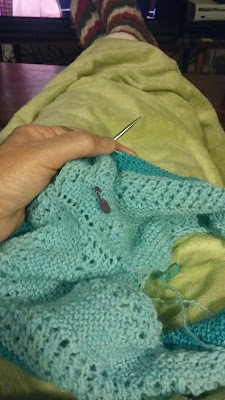 I had the day off from work yesterday and made a bit of progress on my modified Reyna shawl. So, yes, it's a Terrible photo. It's uncropped, has an uncoordinated background and has Terrible lighting. I didn't crop the photo though because if you look closely, you can see I'm wearing my Christmas socks. Don't judge. It was my day off. I stayed in my pj's all day. The air conditioning has finally cooled the house down enough for my husband to be comfortable and for me to need a jacket, blanket and wool socks. So yes, I'm celebrating not only progressing into the second color stripe on Reyna, but also summer, the comfiness of hand knit socks, a day off and Guardians of the Galaxy on TV. One more thing - a Biotin update. My nails aren't growing exactly but they are much stronger. I've been taking Biotin for about eight weeks now. The bottle says it takes six weeks to see a difference. Before Biotin, my nails had the strength of wet tissue paper. You just looked at them and they shredded. Now, they are much stronger and instead of bending and shredding, they snap when they break. I have high hopes that soon, their extra strength will allow them to grow in length. My hair on the other hand... my hair is out of control! It has grown two inches in seven weeks. I think I may have picked a really bad time to try the Biotin. My hairdresser is having a hip replacement & will be gone for a month or two. Yikes!